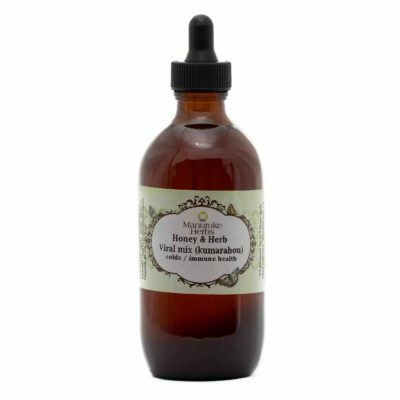 Made from hand picked New Zealand Kawakawa plant, steeped in almond and hemp seed oil. Made using traditional methods of gathering and preparation. Manutuke Herbs has been making kawakawa balm and for over 10 years. What makes our balm different? We also add hand picked Kumerahou in our preparation and manuka oil. Plants sourced by hand using traditional and cultural respect during gathering. In New Zealand it is illegal to make a therapeutic claim about how a product or ingredient works – unless it has been clinical proven (scientifically). We take the traditional use and historical recordings of each ingredient and list them as possible results that may occur when using product. Kawakawa; considered a very spiritual plant a sacred tree with great powers which must be treated with respect when picked and used. In some area’s it is still considered a no no to sleep under it’s branches. In my family we love to eat the fruits of Kawakawa which give a lovely blissful calmness feeling alongside a beautiful slightly peppery creamy taste. Although not a narcotic Kawakawa does have a relaxing effect on the spinal chord and subcortex of the brain – and in certain doses it may create a flaky skin under the eye’s. That is why it is important to buy your Kawakawa product from qualified natural health practitioners/ or traditional healers who are school in correct dosage. Used traditionally for the treatment of gout, treatment of boils (kane) chewing the young shoots for headaches, blood purifier, leaves used to draw infections from the skin. Swellings. Aids digestion. Suggested antimicrobial and insecticidal properties. Applied topically Kawakawa is considered a blood purifier that helps draw and heal skin conditions. Keep in mind balms heat the skin and if an eczema is covered with balms it can spread it. 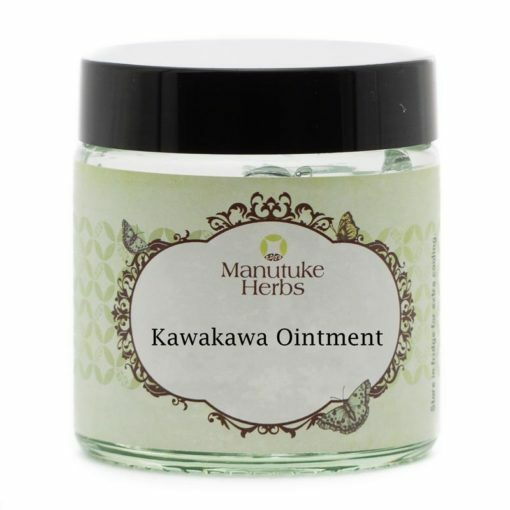 If a chronic skin condition is the issue such as eczema Manutuke Herbs Kawakawa Cream is the best choice. Kumerahou: used traditional as a hair shampoo, when water is applied to the flowers it creates a soapy texture. This is a great cleanser internally and was suggested by a practitioner in the 1960’s in Auckland to help greatly with mutated skin cells and aiding them to heal. You will Kumerahou in several of Manutuke Herbs oral products. We consider Kumerahou to be an amazing cleansing and soothing herb. 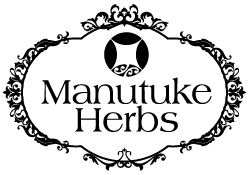 Manuka Oil: Manutuke Herbs sources its Manuka Oil from up the top of the East Coast of New Zealand where the highest readings of UMF are found. Manuka buds when chewed have an amazing clean antiseptic flavour and when applied to the skin Manuka oil is antiseptic. Traditional Maori recipes list Manuka for healing cuts and wounds, blocked sinuses, hayfever, bronchitis, asthma, rheumatism, burns and scalds. Recent medical research studies have shown Manuka Oil to be effective aromatherpy wise with the reducing the infection rates of MRSA and applied topically for wound dressings for staph infections and diabetic ulcers. Borage oil shows promise in the treatment of rheumatoid arthritis, an autoimmune disorder marked by inflammation in the lining of the joints, according to a research review published in 2000. Although most of the data on borage oil’s effectiveness come from test-tube and animal research, several small studies indicate that borage oil may ease tenderness and swelling in people with rheumatoid arthritis. In a 2003 study of 140 adults and children with eczema, researchers found no significant difference between those who took borage oil supplements for 12 weeks and those who took a placebo capsule for the same amount of time. An earlier study of 160 patients found that 24 weeks of treatment with borage oil supplements failed to have a significant effect on eczema.